From the Wichita Pachyderm Club: Robert L. Bradley, Jr.
From Pachyderm: Robert L. Bradley, Jr.
From the Wichita Pachyderm Club: Robert L. Bradley, Jr. He is CEO and Founder of Institute for Energy Research, visiting fellow at the Institute of Economic Affairs in London, and an adjunct scholar at both the Cato Institute and the Competitive Enterprise Institute. His topic at the Pachyderm Club was “The Contra-Capitalist Corporation (In Search of Heroic Capitalism).” This audio recording was made on November 2, 2018. The accompanying visual presentation may be viewed here. 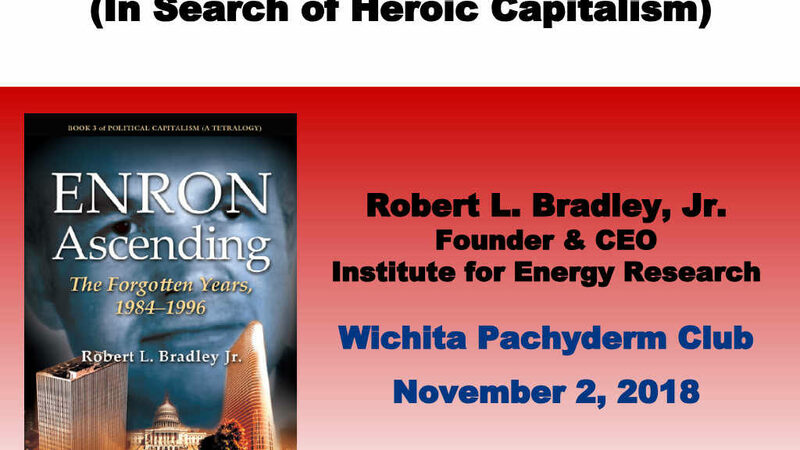 Books by Robert Bradley: Enron Ascending: The Forgotten Years, 1984-1996, Capitalism at Work, Edison to Enron: Energy Markets and Political Strategies, Energy: The Master Resource.